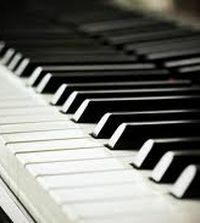 Pianist Sarah Hagen was joined by the Bergmann Piano Duo last February 26th to perform music that evolved from one to six hands at one piano. The opening number was a one-hander by an original composition by Marcel Bergmann entitled "Intrada", and this was followed by "2 hands" played flawlessly by Sarah Hagen to the composition of Mozart's D minor Fantasy K. 397. A German avant-gardist's "3 hands" followed. This time all three participated in this 3-minute rendition of M. Kagel's Eid der Hippocrates, a homage to the first doctor, Hippocrates. Something unique as the piece ended with the three hands touching each other. 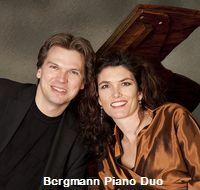 "4 hands" was played by Elizabeth and Marcel Bergmann to Brahms' compositon Variations on a theme by Schumann Op. 23. Such virtuosity by this duo. Then came "5 hands" where all three participated with Marcel using only his right hand to Ravel's Frontispice, and finalyy "6 hands" where all three used both their hands to the music of Rachmaninoff's Romance and Waltz and Baynov's Metrothymia. An encore number followed to the delight of the early morning audience, ending this 75-minute coffee concert.